You guys! 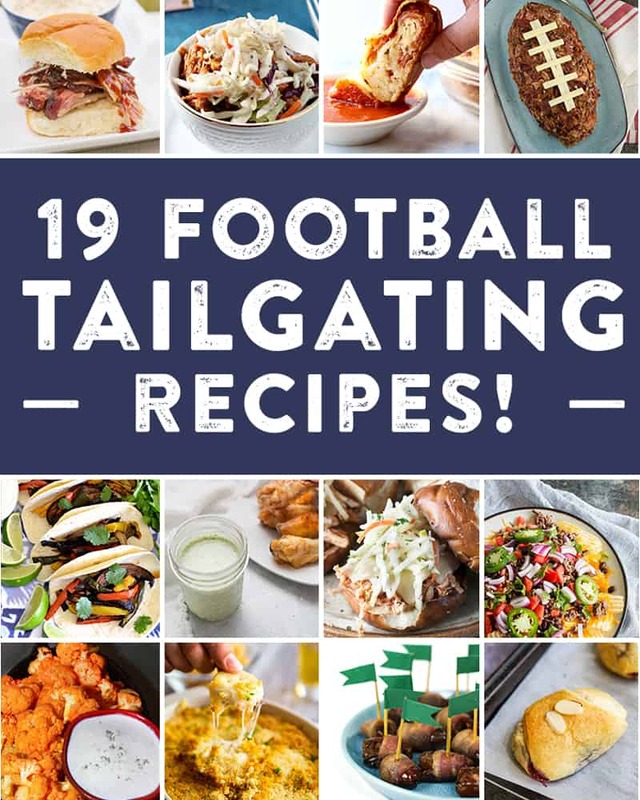 I teamed up (see what I did there…) with 18 other bloggers to bring you the ultimate list of tailgating recipes just in time for football season! There’s a TON of options that I’m sure you’ll find awesome. Just to give you a preview, think of a tailgate with Jalapeño Ranch Dip , Easy Potato Chip Nachos, Traeger Pulled Pork , and Apple Pie Twists. It sounds incredible to me! 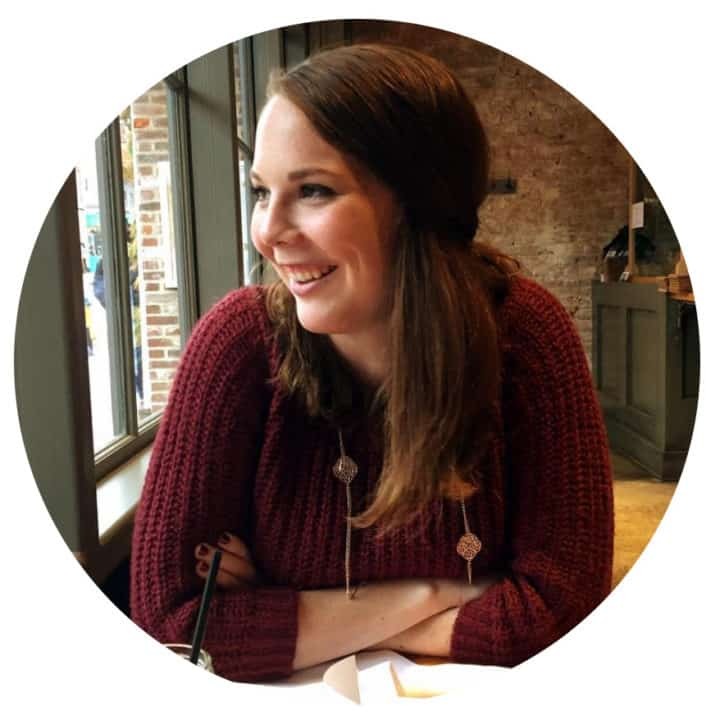 Definitely be sure to go by Susannah’s recipe from Feast + West (Chorizo Stuffed Bacon Wrapped Dates – yum!) and give her some extra love! She put this whole thing together! I made some Baked Brie Crescent Bites which are now probably my new favorite appetizer/snack/food/literally anything. Think of the baked brie round in tiny form. Now tell me who doesn’t love mini versions of their favorite food?! That’s right no one. Brie in general just makes me happy as do carbs so it’s a match made in heaven to start with. I chose to use raspberry jam just because I love the red fruit tartness that pairs with the brie so well. I also added some slivered almonds inside and on top to add the crunch that you’d usually get from the crackers on the full size counterpart. 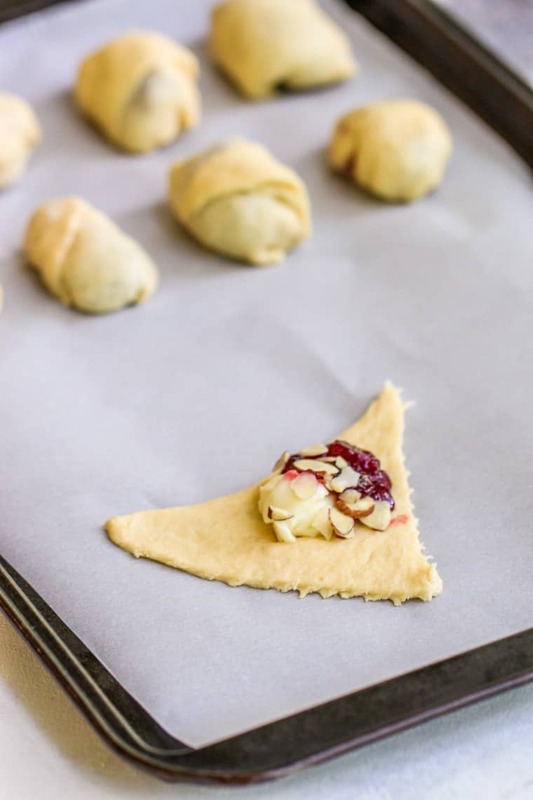 I found the easiest way to make these is to roll out the crescent dough on the countertop and cut each triangle in half. I basically made an assembly line from there adding each component to each triangle then moving on to the next. The hardest part is making sure that your dough is nice and tight so the jam and brie don’t melt too far out of it. It’s going to happen regardless and this is your permission to eat those to make sure they still taste good. 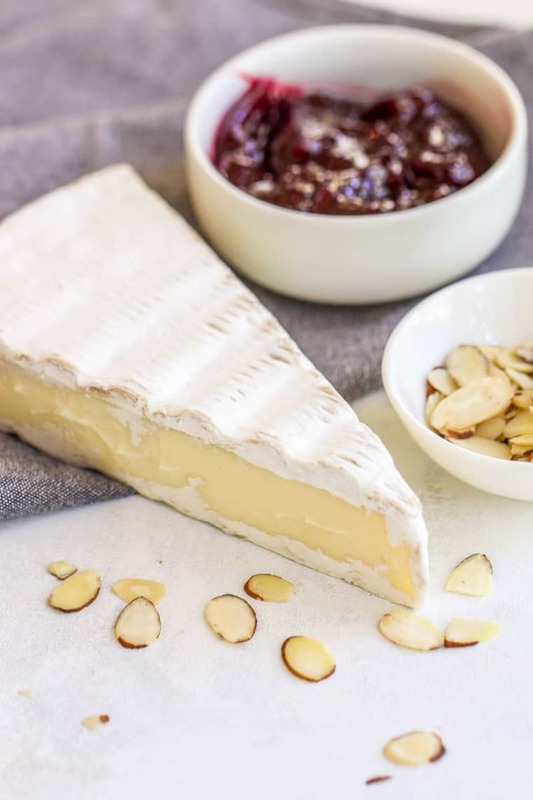 The whole brie rind vs. no brie rind thing is a heated debate amongst my friends. 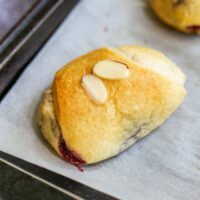 Usually, I’m team rind just to keep it easy, but with these baked brie crescent bites I removed the rind. A lot of that is due to the whole mini version thing. Real estate is limited inside each bite so I removed the rind to make sure everything else could fit! Now I’ll be the first to admit that these aren’t the most well travelable tailgating snacks, but who doesn’t go for melty cheese and carbs when they’ve had a beer or two too many?! I’d definitely suggest these for a home watch party so you can eat them straight from the oven! 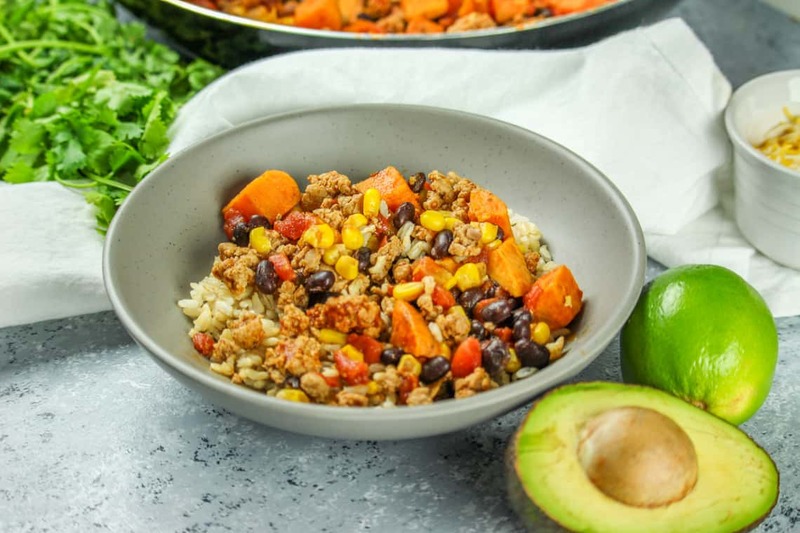 Pair these and some Buffalo Cauliflower + Blue Cheese Dressing and you’ve got yourself a perfect sweet and spicy pairing! 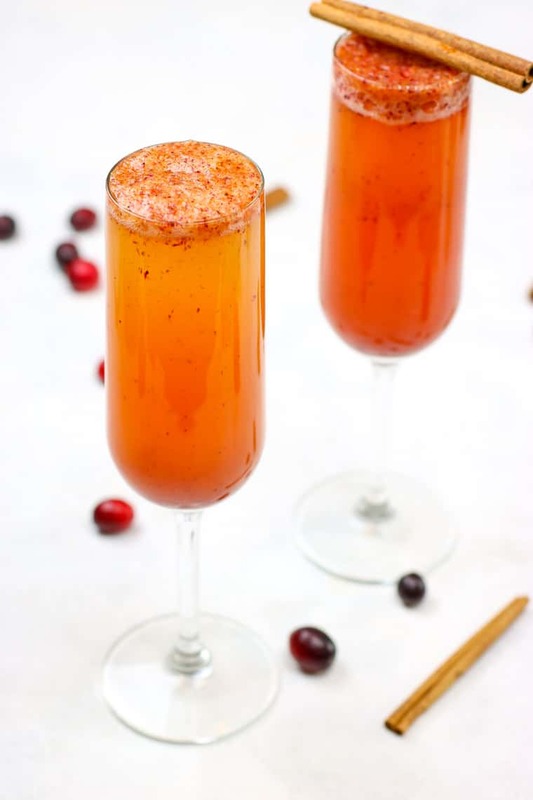 Now let’s talk about these tailgating recipes. They range from dips (hello, Caramelized Onion Dip) to pulled pork (Pumpkin Pulled Pork Bowls – just in time for fall) to perfect appetizers (Easy Pepperoni Bread)… basically the food lovers dream. Be sure to scroll to the bottom to see them all! 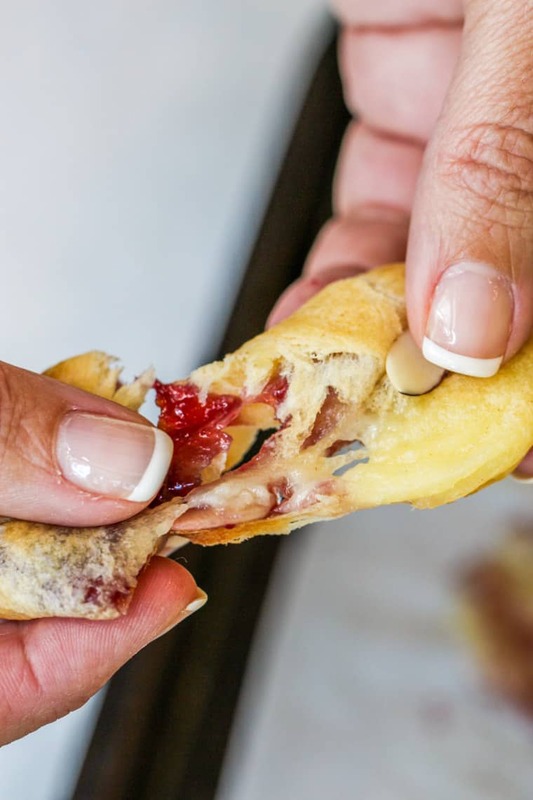 These Baked Brie Crescent Bites are perfect individual servings of the classic appetizer! 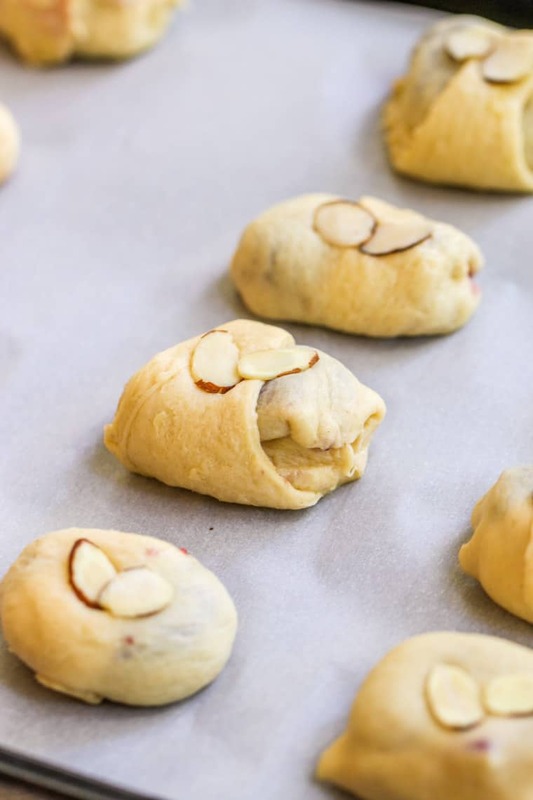 Preheat oven to 375F and prepare a cookie sheet with parchment paper or a silicon mat. Open crescent rolls and cut each triangle into two. Divide brie into 16 even pieces. I removed the rind to keep the space to keep the space open for more jam, but that is up to you! Place one piece on each triangle. 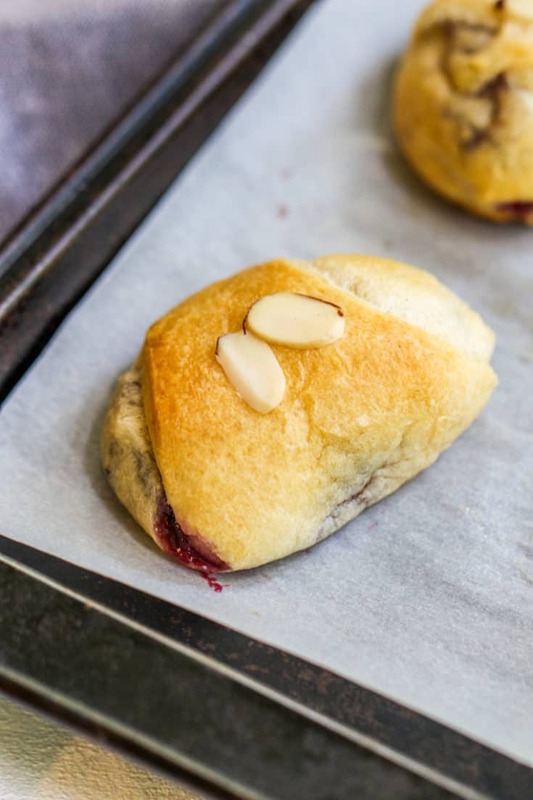 Put 1 tsp of jam onto each triangle and sprinkle with about 1/2 tsp slivered almonds. Wrap the triangles up as tightly as you can and pinch any open edges. Place on prepared cookie sheet and bake 10-12 minutes or until golden brown.